For each adventure, the Bear Scout must complete the requirements as outlined in the Bear Cub Scout Handbook. A parent, guardian, or other caring adult acknowledges the completion of each achievement part by signing the boy's handbook (Akela's OK). The den leader also signs each boy's handbook (Den Leader's OK) and records progress in the den's advancement records. The Bear Scouts also keep track of their own advancement using the Adventure Tracking section in the back of their handbooks. 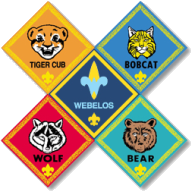 If the Bear Scout has not previously earned the Bobcat Badge, it must be earned first. The Bear Required Adventures are listed below. 5. With your den, plan a cooked lunch or dinner that is nutritious and balanced. Make a shopping list, and help shop for the food. On a campout or at another outdoor event, help cook the meal, and help clean up afterward. 6. Help your leader or another adult cook a different meal from the one you helped prepare for requirement 7. Cook this meal outdoors. 8. Help set up a tent. Pick a good spot for the tent, and explain to your den leader why you picked it. 9. Demonstrate how to tie two half hitches. Explain what they are used for. 10. Learn how to read a thermometer and a barometer. Keep track of the temperature and barometric pressure readings and the actual weather at the same time every day for seven days. reflection and discussion about your family’s beliefs.